Let's learn how to build ships in bottles together. 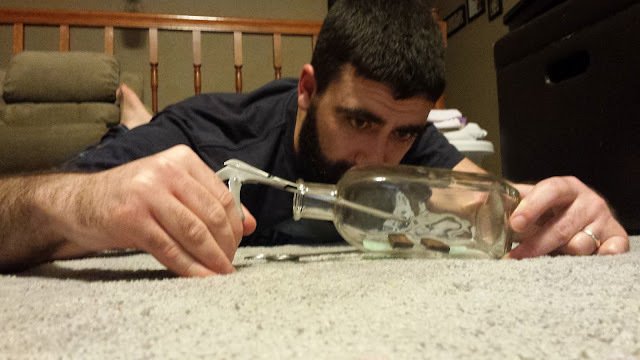 ModelsInBottles exists because ships in bottles are cool and I want to help people take the plunge into this relaxing and rewarding hobby. Startup costs are cheap (like twenty bucks cheap) and you can amaze yourself with what you're able to accomplish--even if you're all thumbs as far as arts and crafts are concerned. All the ships in bottles that I've built are made from scratch with zero expertise. Seriously, if you know nothing about ships other than the fact that they usually float and you can't glue two popsicle sticks together without getting Elmer's all over the floor and your hair, you're exactly where I was when I made my first few ships. In other words you can make your first ship without having any idea what you're doing. So check out the guides, take a look at the shippin tools and supplies page to get an idea what to pick up at the store, and be sure to follow me on Instagram to see progress pics as they happen. Want to know more about me personally? Here you go.